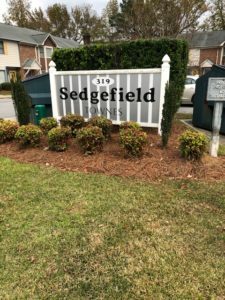 ALL PAYMENTS SHOULD BE MADE OUT TO SEDGEFIELD TOWNES HOA AND SENT TO HOA MANAGEMENT COMPANY 3107 SOUTH EVANS ST. STE B, GREENVILLE, NC 27834. PLEASE REMEMBER TO INCLUDE YOUR UNIT NUMBER ON THE MEMO LINE OF YOUR CHECK. AS A HOMEOWNER IT IS YOUR RESPONSIBILITY TO LET US KNOW IF ANY CONTACT INFORMATION CHANGES, TENANT INFORMATION OR IF YOUR PROPERTY IS GOING TO BE SOLD.